4 November 2015. We are the Solution: African Women Organize for Land and Seed Sovereignty is a campaign in West Africa led by rural women to promote ancestral knowledge and put pressure on governments to take seriously the preservation of agriculture. The campaign seeks to uphold traditional knowledge, which supports food sovereignty and the preservation of peasant seeds, restore national policies favorable to agroecological peasant farming, and promote African agricultural production. 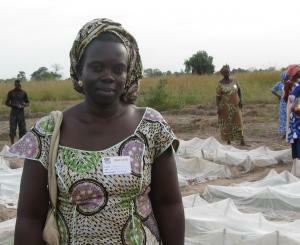 The a campaign is led by rural women from Senegal, Burkina Faso, Mali, Ghana and Guinea. This is the first article in a 7-part series which features interviews with grassroots African leaders working for seed and food sovereignty, the decolonization of Africa’s food system, and the preservation of traditional farming practices. This series is made possible with support from New Field Foundation and Grassroots International. Many thank to Stephen Bartlett for translation of the interview. In Casamance [Senegal], We Are the Solution has established a platform of 100 grassroots associations. There is a model farm field and a store for marketing family farm products from various kinds of production and hand-tool farming. The store is there to help promote ecologically produced products produced by women. We Are the Solution is also trying to organize a forum on local consumption.